At almost 3500 square feet, the Scofield is equally as attractive on the inside as its exterior portrays. The common rooms all include special custom touches, while the private rooms are spacious and plentiful. When walking into the foyer, the dining room with coffered ceiling is instantly apparent and immediately spills into the great room. A fireplace and multiple sets of French doors accent the two-story great room. The kitchen/breakfast area includes a large center cooktop island and an adjacent family room with window seat. Upstairs, three bedrooms each have their own bath and a balcony overlooks the great room below. 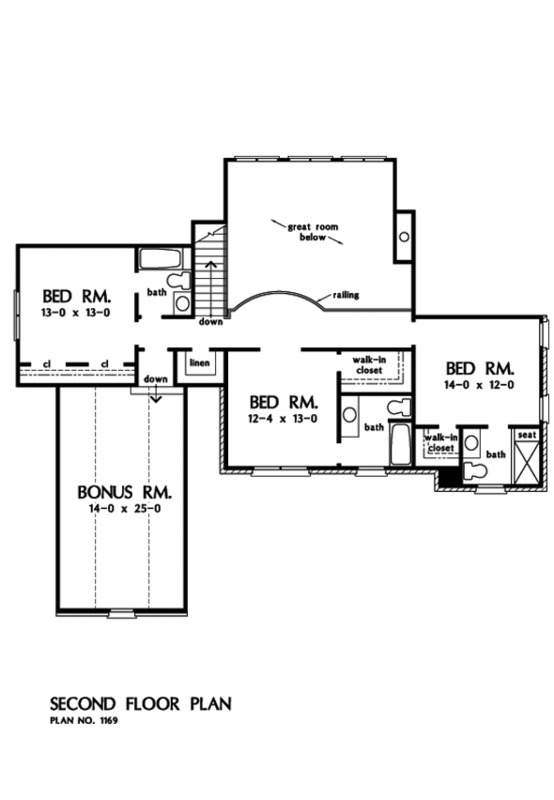 The master suite is on the first floor and takes up an entire wing of the home. A curved sitting area adds a nice touch to the bedroom, as does the tray ceiling. Dual walk-in closets grant privacy and space, and an elegant master bath with center garden tub and twin vanities provide indulgence at the end of the day. 1st Floor: 2374 Sq. Ft.
House Dimensions: 59' 1" x 72' 0"
Great Room: 20' 8" x 17' 4"
Bedroom #2 : 13' 0" x 13' 0" x 8' 0"
Bedroom #3 : 12' 4" x 13' 0" x 8' 0"
Bedroom #4 : 14' 0" x 12' 0" x 8' 0"
Bonus Room (Vaulted): 13' 6" x 25' 0" x 9' 0"
Dining Room (Other): 12' 4" x 14' 4" x 10' 0"
Family Room (Vaulted): 19' 4" x 22' 8" x 10' 0"
Foyer (Other): 6' 0" x 14' 0" x 10' 0"
Great Room (2 Story): 20' 8" x 17' 4" x 19' 1"
Kitchen : 19' 4" x 13' 4" x 10' 0"
Master Bedroom (Tray): 14' 0" x 17' 4" x 10' 0"
Other (Cathedral): 12' 0" x 6' 0" x 0' 0"
Patio - Rear : 25' 6" x 15' 6" x 0' 0"
Porch - Rear : 27' 6" x 8' 0" x 0' 0"
Porch - Front : 19' 10" x 8' 4" x 9' 2"